NORMAN (August 16, 2017) – Death, alcoholism, and family involved with gangs in a neighboring city made going to school difficult for a 16-year-old Norman girl. That was before she had a baby. Three years later, she has a high school diploma, a national award for poetry and plans for college. Dimensions Academy, an alternative school in Norman serving grades kindergarten through 12, and the district’s Baby Steps program are providing life-changing opportunities for kids who need more than traditional schools can offer. Often alternative schools are perceived as a last resort for delinquent students. But Justin Milner, assistant superintendent for administrative services for Norman Public Schools, said Dimensions creates a safe place focused not only on academic needs but the social and emotional needs of its students, many of whom are the victims of trauma. Dimensions students come from diverse backgrounds. Some are suffering from the death of their parents, extreme poverty, physical abuse or a home with substance abuse. Others just need a smaller learning environment than Norman’s two traditional high schools, where enrollment exceeds 2,000 students per school, can offer. Dimensions serve about 70 students at a time in its high school. Alternative education programs are a holistic approach to meet each student’s needs, said Jennifer Wilkinson, director of alternative education for the Oklahoma State Department of Education. While the main goal is academics, most alt-ed programs place additional focus on life skills, arts education and counseling. “Alternative education programs are tailored to meet the needs of the individual. These are students who for one reason or another are not successful in a traditional setting yet thrive in smaller, hands-on environments,” Wilkinson said. Dimensions is one of 274 alternative public education programs in Oklahoma serving about 12,000 students. Oklahoma is seeing success with the programs, as state graduation rates for alt-ed programs increased three percentage points from 2015 to 2016. Milner said he knows teachers’ tenacity and individualized instruction is working at Dimensions because he’s seen a significant decline in the number of students dropping out. If students are chronically absent, the staff visits them at their homes or workplaces to encourage them to return to school. “Going to our senior celebration every year, I walk out of there just in tears because you hear the stories of these kids and all the adversity they’ve overcome to get this high school diploma. And you think, ‘Wow, it was really too easy for me,’” Milner said. Courtney Osborn, 15, came to Dimensions when anxiety began to interfere with her schoolwork. The unease of a large school caused her to miss classes for doctor appointments, which snowballed into greater anxiety when it became even more critical that she pay attention to catch up on missed work. Osborn now splits her days between Dimensions and her home school, Norman North High School. Dimensions teachers are specifically trained to relate to students who have experienced challenges in their lives. Some of the school’s teachers are also licensed counselors. One of the school’s strengths is its flexible learning strategies, said Paul Tryggestad, director of Dimensions. Teachers can create learning plans that fit a student’s needs but still are rigorous, have high standards and prepare them for postsecondary education. “Our mission/vision is to really restore hope for these students while connecting them to their future. We don’t want our goal to be just a high school diploma. I want the kids to look out ahead to careers and college,” Tryggestad said. Osborn has her future mapped out: She plans to have a cosmetology certification by the time she graduates from Dimensions, work for one to two years to save money for college, earn a degree in nursing – and own a big, furry dog. Dimensions also acts as a resource in the community. When Norman Addiction Information and Counseling sought dialogue between youth and city leaders, it invited students from the school to sit on a panel at a town hall meeting. Osborn was one of the eight who brainstormed how to reduce underage drinking and substance abuse. Osborn’s ideas, born out of the empathy she has for others, led to solutions intended to raise awareness of mental health resources available to students. She argued that the temptation to self-medicate against depression and emotional struggles can lead to drug abuse more often than peer pressure. Houston Pretty Bear, 18, found himself two and a half years behind in his coursework after bullying made him lose interest in school. After one year at Dimensions, he graduated with his senior class. He said it is a great place for students who don’t fit in at traditional high schools. “At Dimensions, they understand. They teach the stuff you need to know and make sure you get it. The smaller classrooms are a lot easier because teachers can actually go to each student and find a way they can learn,” Pretty Bear said. Tryggestad said each student must demonstrate a commitment to complete high school to qualify for admittance to the school, and the school’s intimate size helps hold students accountable because they’re not lost in a crowd. “We’re small, so that allows students the opportunity to quickly build relationships with staff and to really feel like part of a family. By building those relationships, they’re more motivated to come to school,” Tryggestad said. Pretty Bear is enrolled at Oklahoma City Community College to study engineering in the fall. He later hopes to get a master’s degree in robotics and work at Tinker Air Force Base. Tryggestad said the school’s pace is more condensed, and credits are based on competency rather than seat time, meaning if students are willing to work hard, they can make up several courses. While in some courses like English, the students work on lessons as a class, other classes such as computer science are self-paced. This format allows the school to tailor an education plan to fit each student. One of the reasons Pretty Bear graduated on time is because one of the teachers, out of her own pocket, helped pay for a book for his senior project. Milner said it’s that level of support and stability that spurs students to want to come to school. “I think back to one student who we had last year who left the funeral of her father and reached out to the school and said, ‘Can I come in? I need to be at school,’” Milner said. 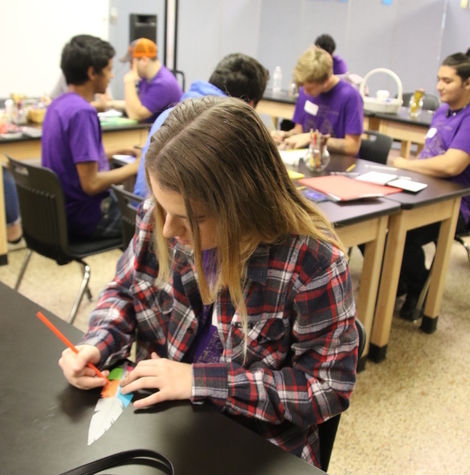 Dimensions is also finding ways to support the children of its students through the Baby Steps program, which serves Dimensions, Norman High School and Norman North High School. Program director Angela Johnson teaches the high school course specially designed for teen mothers. It covers child development, parenting, positive guidance, sleep, feeding, prenatal development, and labor and delivery. Baby Steps is a coalition created by the Junior League of Norman with the Center for Children and Families, Norman Public Schools and Crossroads Youth and Family Services. Crossroads manages an early Head Start program for children from 6 weeks to 3 years old. In a typical day, a mother will ride the bus with her child to the Head Start house, take the Baby Steps class first hour, then bus back to her home school. At the end of the school day, a bus will take her back to the house, then transport her and her child home. Johnson elaborated on the story of the 16-year-old girl introduced above who turned her life around in the face of incredible odds. The girl’s mother and sister had both died in the year and a half before the girl joined Baby Steps. Her father had an addiction and was unable to take care of her or her unborn baby. Johnson said the girl graduated in May after living on her own for two years and juggling transportation, bills, a job that was her sole income and a young child. At one point she was in jeopardy of losing her housing because she needed a brother or sister to stay overnight to watch her baby while she worked, but overnight guests were against housing rules. “With her it has been a three-year process of teaching life skills and how to navigate life,” said Johnson, who handles case management and is available for informal and crisis counseling. Her Baby Steps class also functions as a support group for the girls. Johnson said her student has learned to handle crises, communicate effectively and make decisions for the long-term benefit of herself and her child. “It infiltrated my heart completely within five minutes of walking in the door. I saw the effervescence of the faculty and staff, and the commitment that was genuine that they have toward the students,” said Weller, a Bram Stoker Award-winner and Ray Bradbury’s authorized biographer, who first visited Dimensions while in town for the Pioneer Library System’s Big Read in 2016. Weller, an associate professor at Columbia College Chicago, said as a writer, he noticed key details at Dimensions that told a bigger story. “I know what it’s like to phone it in as an instructor. I’ve seen it. We all have our moments as teachers when we’re not on our A-game. This place was on its A-game the minute I saw it, and I saw it right away,” Weller said. Weller’s observations at Dimensions have altered the way he approaches his college classes. He said he reflects differently on his teaching and is now more enthusiastic about his lessons. Weller said during the festival the guest authors were amazed at the depth of the students’ insights and their ability to use their life experiences to connect with those of the writers. Gillian Flynn, the author of the best-selling novel “Gone Girl,” speaks to students at Dimensions Academy in Norman via Skype. 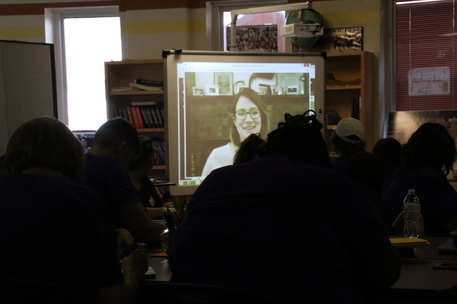 Sam Weller (center) listens as Gillian Flynn, author of the best-selling novel “Gone Girl,” speaks to students at Dimensions Academy in Norman via Skype.